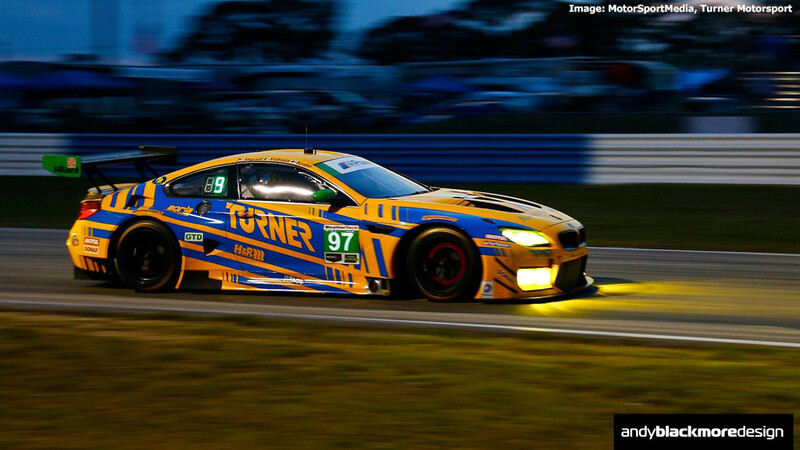 Following a successful IMSA class championship winning campaign with the BMW Z4 GT3 with my previous livery, Turner Motorsports began a new era in 2016 racing two all new BMW M6 GT3 race cars. 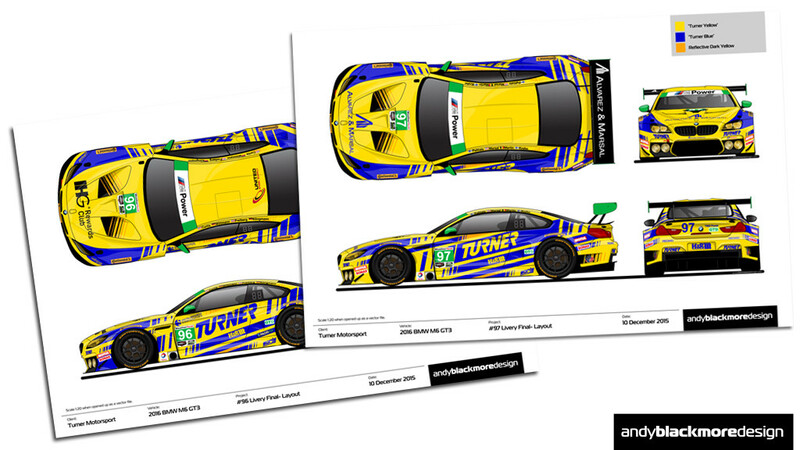 The Z4 was my first project with Turner Motosport, but I had previously created numerous Z4 GT3 liveries for various Schubert/Team Need for Speed variants and the Saudi Falcons chrome entry at Dubai a few years ago, so knew the challenges of short wheelbase, incorporating the number panel in this smaller space and the wide fender flares. 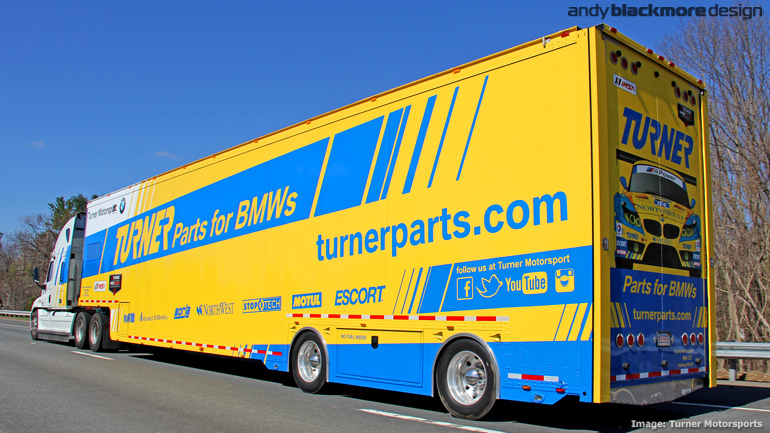 The success of the Z4 lead me to other projects including their race team hauler and pit banner partition system, all of which, you can read about HERE. Press Announcement prior to the 2016 season. The next chapter started earlier in 2015. 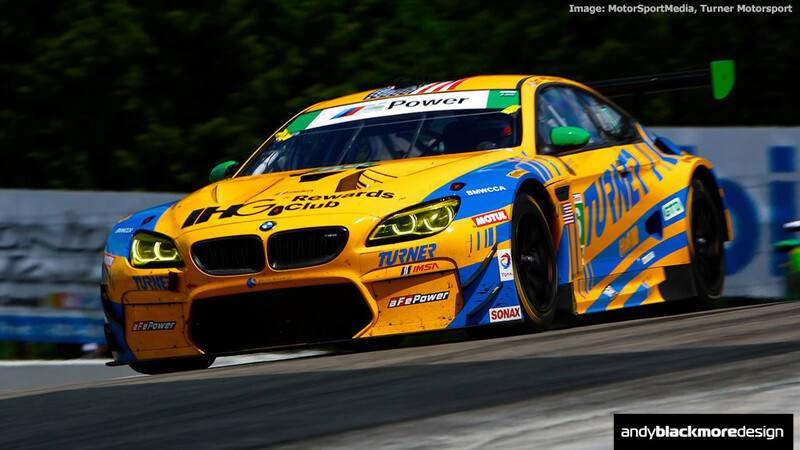 BMW had announced the new racer but no one had actually seen the car close up. 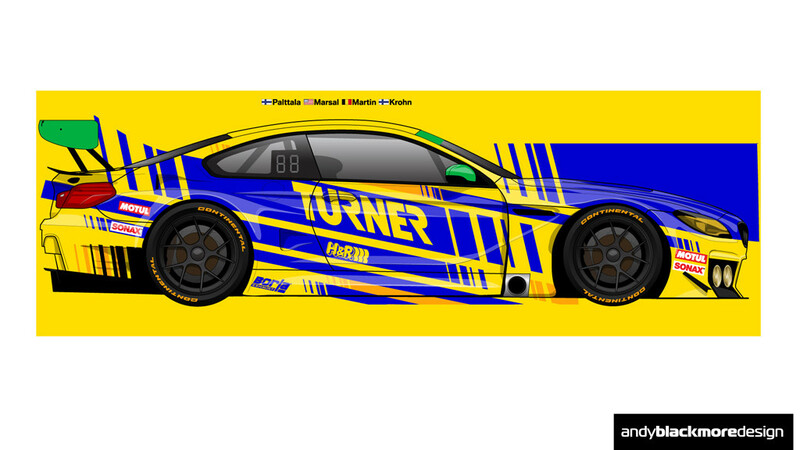 Turner commissioned me to create an artist impression with a BMW Z4 inspired livery. At the same time, a few testing images appeared and armed with the source photos I was able to create an accurate illustration. So accurate, on day of the press release, BMW were busy asking the team how they had obtained the scale line drawings! 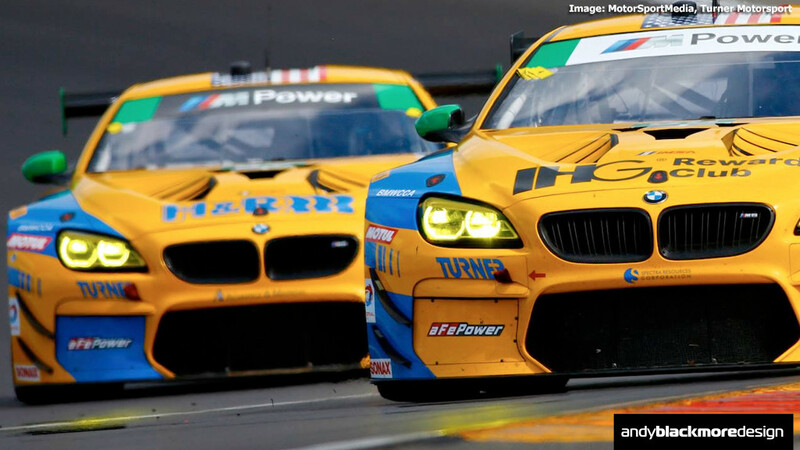 The press release also included this cool quote from Turner Motorsport Director of Marketing, Jay Baier. 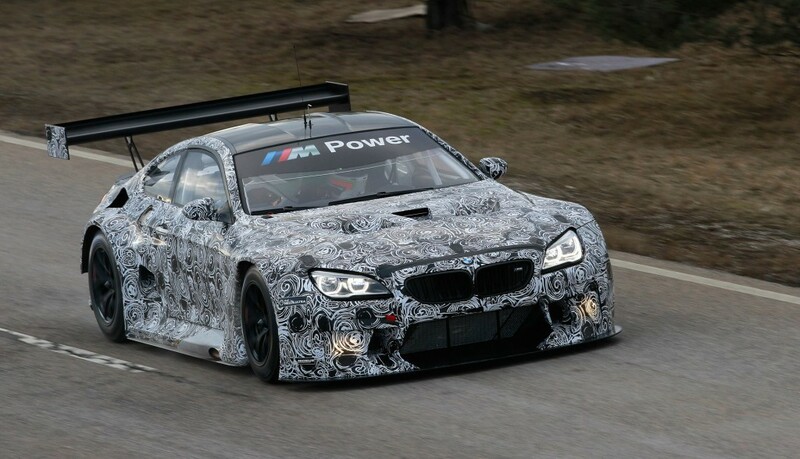 When I did finally get the line art from BMW to create the final livery design, it was very close, with some small differences to front bumper, the dummy air outlet on the front fender and the exhaust location, which changed during testing. Compare the final Daytona spec design with the concept art. Note, Class panels had been revised to Green after the original concept went to press in August 2015. Towards the end of the year, we moved onto the next stage. 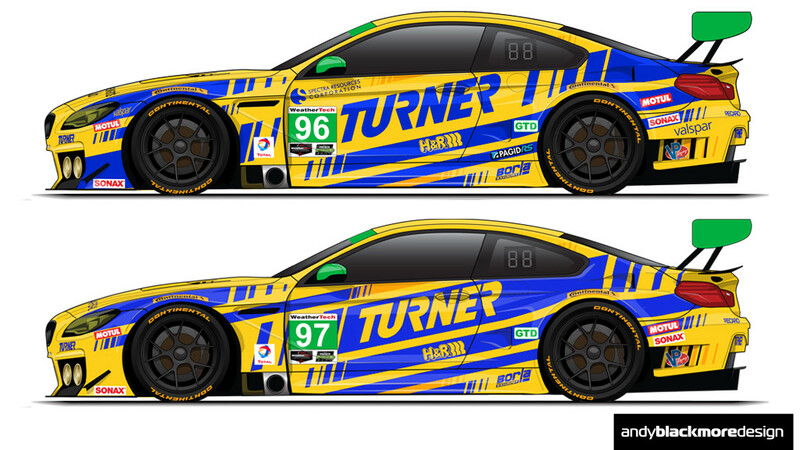 Turner commissioned me to create a new livery for their final race cars. 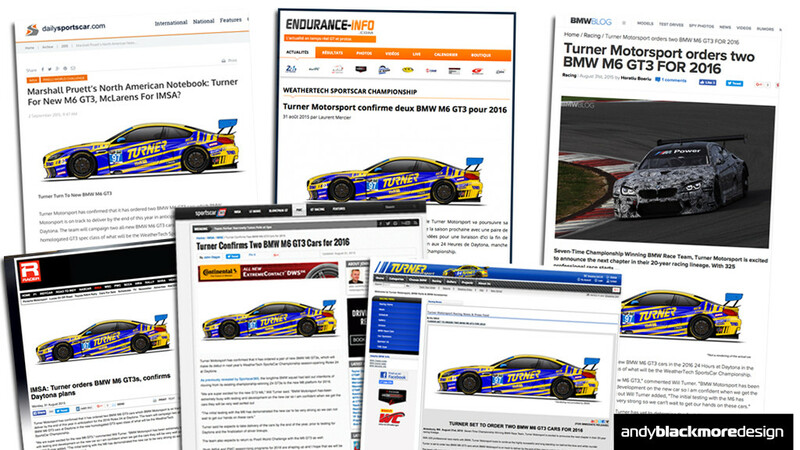 We explored a couple of avenues, including taking elements of older liveries but in the end up developing a design based around the Z4 GT3 concept and the M6 press release, both of which had been well received. The car has a completely different profile and proportion to the Z4, visually one of the longest wheelbases in its class, so it took a little work get the angles and proportions of the stripes to work in the same way. 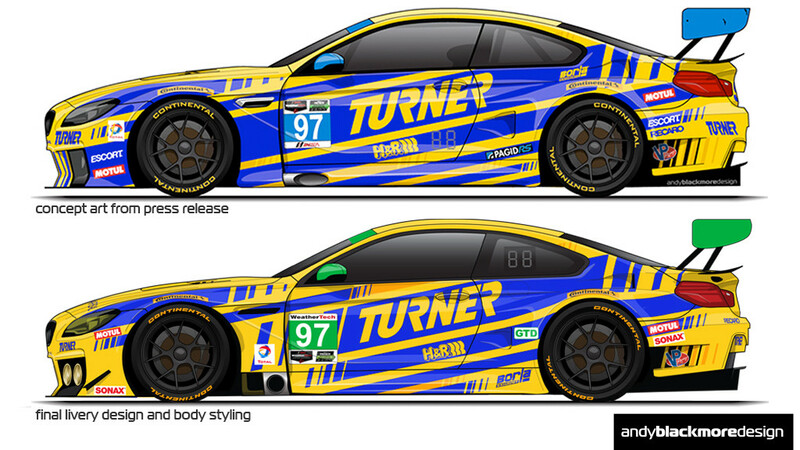 It was hard to choose, so in the end, the team decided to run one car with TURNER in Blue and one in yellow. The 96 car also carries an extra sponsor, so the extra yellow under the door mirror really helps. The final base design is the same aside from the two middle stripes. 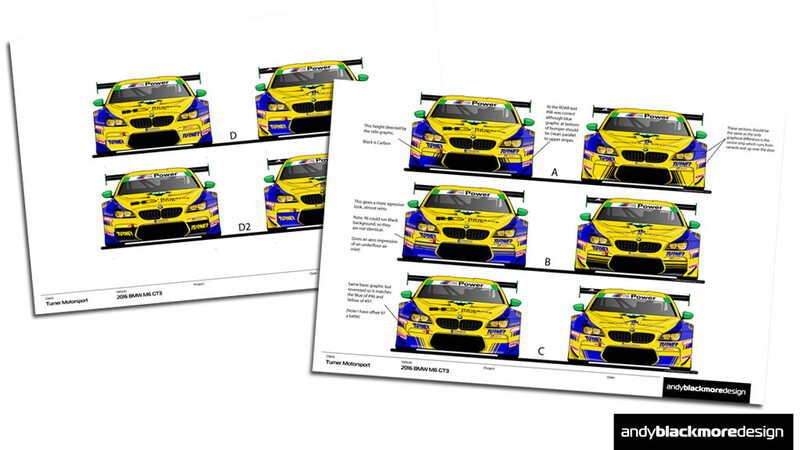 With most designs, I provide the team with a final design file (see above) and a wrap file. 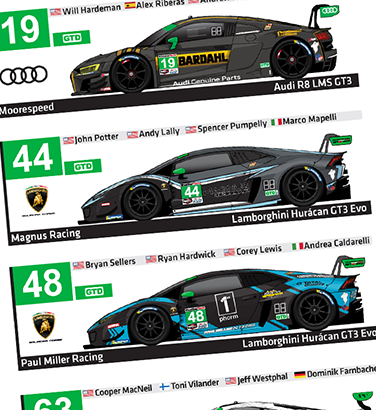 The wrap file shows all the vinyl/print which has to appear on the car. it includes bleed, always has the logos on a separate layer (I recommend applying these after rather embedding them into the design as you can never be 100% how a 2d graphic will wrap on a 3D file). 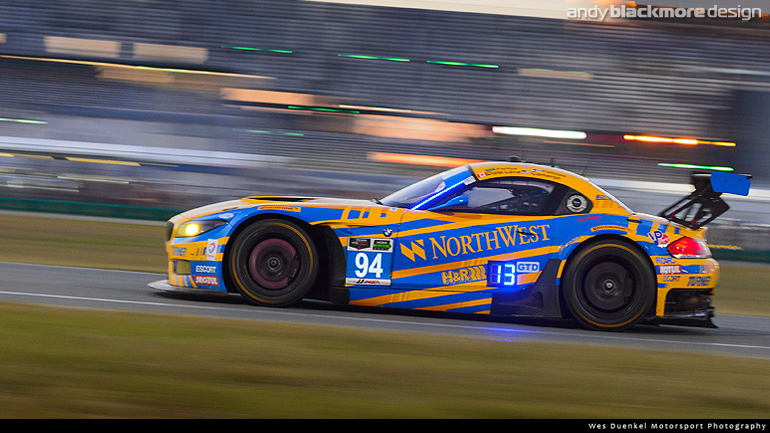 You will notice series branding isn’t shown as that is provided by the series, IMSA. Post Daytona, the cars also ran with covers over the driving lamps, these were reversed to aid identity by team and fans. Tried a few concepts one night, but ended on a simple design (D) which is quick to wrap and add to the car. Form FOLLOWS function. Really pleased how this came out, with the relatively soft curves and flares of the M6 it was a challenge to wrap the car and retain the angled geometric look of the car. 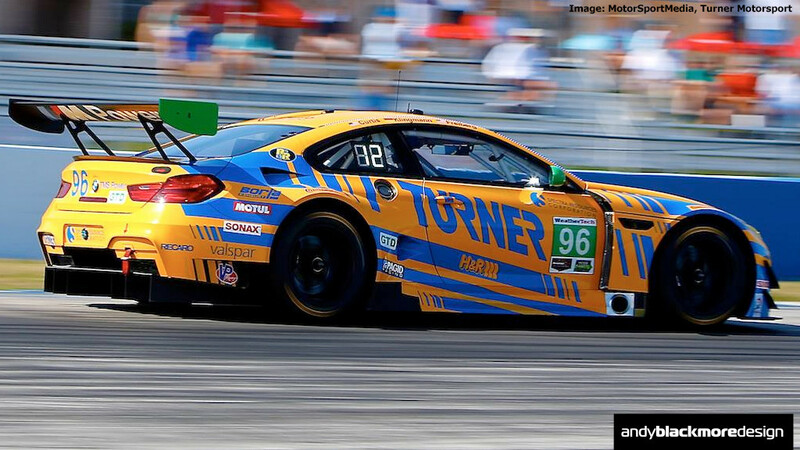 It is another key livery in the history of Turner Motorsport, retains the modern Turner look and one of the most vibrant cars on the grid. 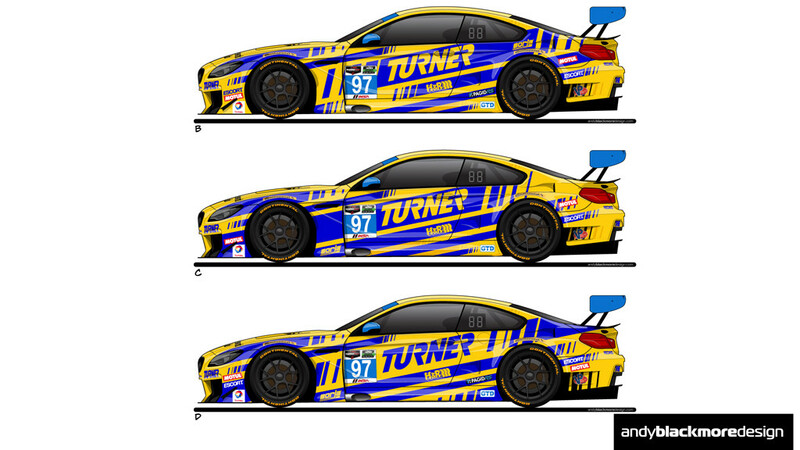 Thanks once again to Will and Jay at Turner Motorsport for the opportunity. 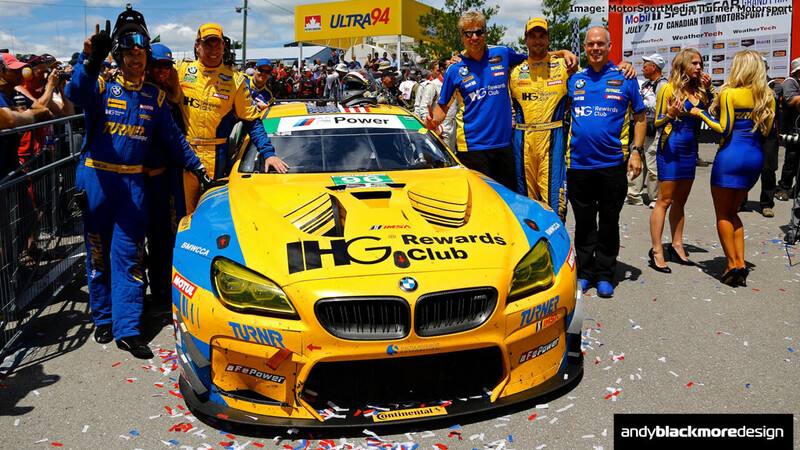 Great to see then take the first North American win with the M6 at Canadian Tire Motorsport Park (above). Always great working with these guys.